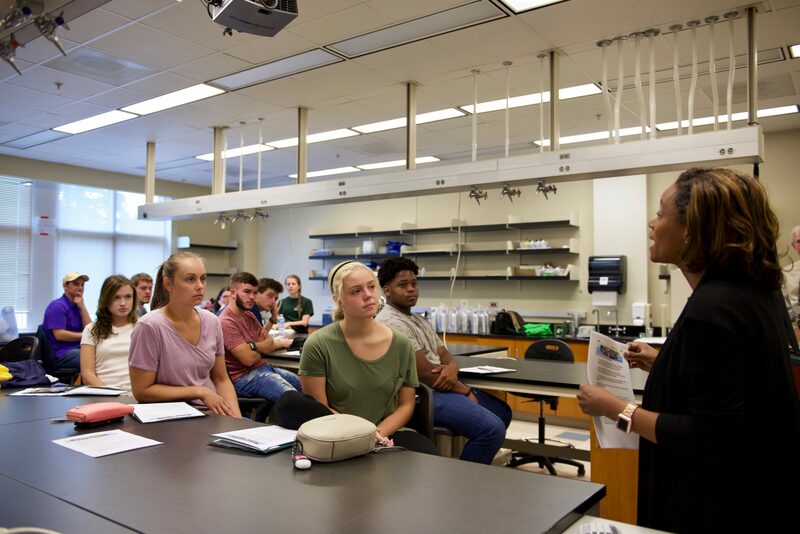 A new collaborative effort called the Bridges to Baccalaureate Program is designed to help students at UNC Charlotte, Gaston College, and Rowan-Cabarrus Community College complete undergraduate biomedical degrees and, ultimately, succeed in biomedical careers. The initiative is made possible through support from the National Institutes of Health, with funding expected to total $1.37 million over five years. The program will work with a total of 45 students who will earn their associate degrees at Gaston College or Rowan-Cabarrus Community College before transferring to UNC Charlotte to complete their bachelor’s of science degrees in the biomedical sciences. The program builds upon a strong existing partnership among the three campuses, which in spring 2018 announced funding from the National Science Foundation for the SPARC4, or STEM Persistence and Retention via Curricula, Centralization, Cohorts, and Collaboration Project. The three partners anticipate sharing educational best practices that have been developed or improved during the two projects. While they are not the same, the projects will complement each other. The Bridges to Baccalaureate Program will focus on exposing students to targeted resources and experiences. “This grant gives our students an exciting opportunity to get real world research experience. This experience will not only help students support themselves financially, but it will also give them a unique relationship with faculty in a lab setting. Students will quickly learn if a biomedical career is for them,” said Dr. Carol Scherczinger, dean of arts and sciences at Rowan-Cabarrus Community College. The partnership includes three areas of emphasis, following what is commonly called a Guided Pathway to Success model. Gaston College students visit UNC Charlotte Biological Sciences labs to build relationships and learn about classes. First, students will receive intensive academic advising while using “degree maps” to help them chart their academic course. They also will experience individualized mentorship, cohort learning, and embedded course tutoring at the community college and university institutions. Second, students will conduct independent research projects with faculty at the community college and later at UNC Charlotte. Research at UNC Charlotte will include both summer and academic term independent research in a laboratory, conducting cutting-edge biomedical sciences research. These experiences will culminate in poster and oral presentations both on campus and at national scientific meetings as well as opportunities to publish in peer-reviewed journals. Third, to promote a sense of inclusion and understanding of how biomedical sciences fit in the broader community context, transfer students will be paired with senior student mentors at the university level, attend regional networking events for biomedical professionals, participate in professional development workshops, and take courses in bioethics. Recruitment of students will include a focus on increasing the numbers of students from underrepresented groups in STEM into the biological and biomedical sciences majors. These would consist of underrepresented ethnic and racial groups, women, people with disabilities, and those from rural areas with low incomes. The regional project is expected to contribute to the nationwide conversation around the issue of what helps – or hinders – community college students as they strive for careers in STEM fields, particularly in the life sciences. Each year, UNC Charlotte welcomes more community college transfers than any other North Carolina college or university. Collaborators at each institution include faculty from diverse disciplines, as well as institutional leadership. At UNC Charlotte partners include the College of Liberal Arts & Sciences, the College of Health and Human Services, J. Murrey Atkins Library, and the University Transfer Center, which is a resource for transfer students. Faculty participants and lab resources also come from other colleges, including the Lee College of Engineering and the College of Computing and Informatics. Research reported in this publication was supported by the National Institute Of General Medical Sciences of the National Institutes of Health under Award Number R25GM128571. The content is solely the responsibility of the authors and does not necessarily represent the official views of the National Institutes of Health. 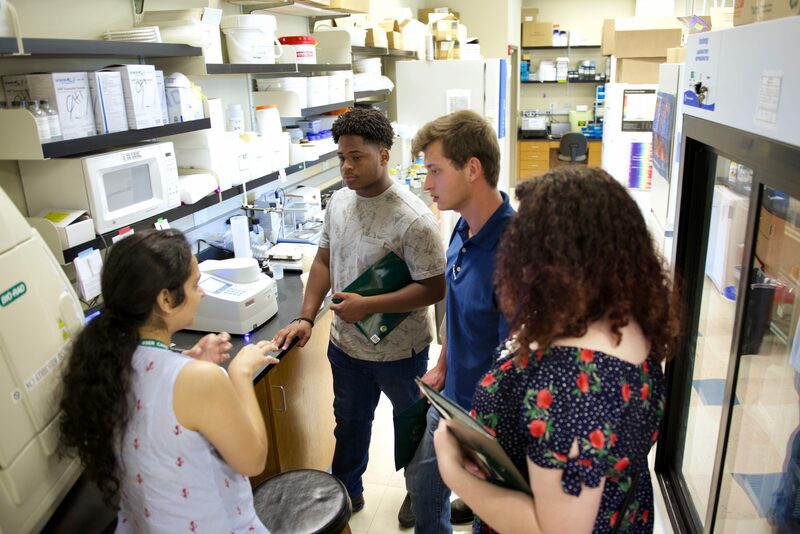 Words and Images: Lynn Roberson, CLAS Communications Director | Images show SPARC4 students from Gaston College visiting UNC Charlotte Biological Sciences labs.